Las Vegas pro Isaac Haxton leads the way after Day 1 of the opening event of this year’s PokerStars Caribbean Adventure (PCA) at Paradise Island’s Atlantis Resort and Casino. 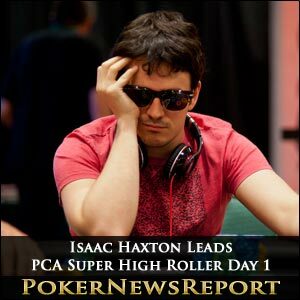 Isaac Haxton was the only player to break through the one million chip barrier in the $100,000 buy-in Super High Roller to sit on 1,240,000 – way ahead of Team PokerStars Pro Viktor ‘Isildur1’ Blom, of Sweden, who holds 875,000 after the opening day. Vegas-based Erik Seidel is third on 753,000 chips at the ninth staging of the PCA, while he is followed by two Team PokerStars Pros in Canadian Jonathan Duhamel (729,000) and San Jose-based Costa Rican Humberto Brenes (609,000). 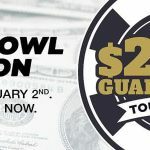 A total of 30 players paid the huge buy-in with two entries – Duhamel and Bill Perkins – deciding to re-enter after being eliminated to create an official entry of 32 and a prize pool of $3,136,000. However, it is Haxton who leads the way after eight levels on the opening day as all 18 survivors aim to get their hands on the $1,254,400 top prize. Haxton – who picked up $581,806 for his third place finish at last month’s $100,000 No-Limit Hold’em High Roller event from the World Poker Tour (WPT) Doyle Brunson Five Diamond World Poker Classic at The Bellagio in Sin City – got off to a flying start to take the chip lead inside the first two levels when the blinds were 1,200 and 2,400 with a 300 ante. The 21-year-old Viktor Blom, in the hijack seat, raised to 2,600, while small blind Haxton responded with a three-bet to take it to 10,500, only for big blind Duhamel to then four-bet to 24,200. Blom quickly folded, but Haxton upped the pot with a five-bet of his own to make it 42,200 to go. Quebec’s Duhamel – the 2010 World Series of Poker (WSOP) main event champion for $8,944,310 – moved all-in for approximately 205,000 and was called by Haxton. Haxton showed Q♦ Q♠ while Duhamel revealed A♣ K♠ to have the American in front ahead of a flop that came down J♦ 8♥ 2♣. Still in front, Haxton was thrilled to see the 5♦ arrive on the turn and the 10♠ on the river to give him the pot and send Duhamel scuttling off to stump up another $100,000 at the re-entry desk. But Haxton was not finished there as he moved further clear during level seven with the blinds at 2,000 and 4,000 with 500 antes when eliminating Florida-based Justin ‘Boosted J’ Smith. In the hijack seat, Smith placed a bet of 10,000 into the pot, only for small blind Haxton to three-bet for 30,000. However, Smith then shoved all-in for approximately 246,000, but was swiftly called by the chip leader. Haxton, who easily covered Smith, held J♥ J♠, while Smith showed A♥ K♠ to be behind. The flop gave Smith no help as it showed 9♦ 6♣ 6♦, while the turn of 10♣ and river of 3♠ meant he was out as Haxton moved on to 930,000 or thereabouts. Haxton added another 300,000 to his chip stack to end the day in control on 1,240,000. Nicknamed The Lizard King, Haxton is no stranger to making the money at big events after cashing 17 times at the WSOP. However, he faces some incredibly tough opposition as the likes of Blom, Seidel, Duhamel and Brenes remain in contention, as do high-roller expert and Team PokerStars Pro Jason Mercier (514,000), Scott Seiver (365,000), Mike ‘Timex’ McDonald (577,000), Team PokerStars Pros Daniel Negreanu (346,000) and Bertrand ‘ElkY’ Grospellier (112,000), and last year’s PCA main event winner Galen Hall (380,000). However, several big-names pros failed to make it through Day 1, including Team PokerStars Pro Eugene Katchalov – last year’s Super High Roller winner after he beat Negreanu heads-up for a $1.5 million win in a 38-player field – as well as Masa Kagawa, Perkins, Sandor Demjan, Alexey Repik, Terje Augdal, David Benefield, Philipp Gruissem, Shawn Buchanan and Matt Glantz. New York-based Katchalov, who has one WSOP bracelet to his name from last year, exited during level seven when heads-up against fellow Ukrainian Yevgeniy Timoshenko. Seattle-based Timoshenko, in the cut-off seat, raised it to 9,000, only for small blind Katchalov to up that to 18,000. But Timoshenko, after taking his time, then moved all-in, leaving Katchalov with a tough choice as he held fewer chips than his countryman. However, after some deliberation, Katchalov made the call for his last 114,000 chips while holding A♦ J♣ to trail the K♠ K♦ of Timoshenko. The flop came 10♦ 9♠ 3♦ to give Katchalov no assistance and, following a turn of 4♠ and a river of 5♠, he was out and unable to successfully defend his title. 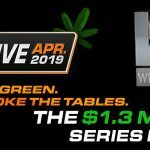 Of course, we here at Poker News Report will keep you updated on this event, as well as the $10,000 buy-in main event that kicks off tomorrow. Last year’s main event attracted a 1,560-player field – which saw Hall emerge victorious for $2.3 million – and this year’s staging of the tournament will be shown online with a 40-minute delay at PokerStars.